Overall, it was fine. I have such a difficult time ranking books for middle-grade because they just are what they are to me. I either see them as something I want to read aloud to kids or something I don't. I probably wouldn't read this aloud, but I would hand it to a middle-school student who likes historical fiction. Essentially, a small town in western Pennsylvania after WWII. There's an outcast, a bully, and a main character who is attempting to do the right thing. Eh. This wasn't awesome. I loved I Let You Go because it was well-written, suspenseful, twisty, and had characters I wanted to root for and characters I wanted to hate. Let Me Lie was well-written but the one big twist was enough...it kept throwing in little twists along the way. And I didn't love the characters or hate the characters. It was kind of forgettable, overall. Read I Let You Go if you haven't already. Gretchen Rubin talks about this book a lot. It's YA historical fiction, taking place right after WWII. I liked it and read it in just a few days. It's a story about a teenage girl, her mom, and her stepdad in the aftermath of WWII. They take a trip to Florida, there's a hurricane, they meet some interesting people, etc. There's a conspiracy of sort happening. It's just a good book. I would say a teenager would like it, but I truly appreciated that it was about what happens after someone returns from fighting in a war, not about just the war. This presents as YA and almost middle-grade-ish because it's about a 6th grader. Do not hand it to a kid. It's definitely for adults. This was SO good. Like, just so, so good. Essentially, the main character is reflecting back on what her life was like growing up in southern California when a catastrophic event happened when she was 11 years old. It's a bit sci-fi in a way, but I think anyone would like it. Basically, the rotation of the Earth slows and all kinds of horrible things ensue. I heard about this on Book Riot's All the Backlist podcast. I *usually* listen to their podcast All the Books every week and I *usually* am completely uninterested in all of their suggestions (but I keep listening). This, on the other hand, seemed interesting and I'm glad I picked it up at the library. This was a quick read and very entertaining. I enjoyed the pace and the fact that it was so different from what I've experienced as a teacher. As the teacher, I've always had to do all of these things because room moms haven't existed at my schools. I just thought it was a great, fast-paced realistic fiction story. Perfect for a summer day (and I read it in two days so you could easily do it in one by the pool or on the beach, I bet). This was compared to Forever by Judy Blume, and said to be inspired by it as well. Forever is one of my very favorites (a strange admission), so I grabbed this from the library. It's YA but errs on the adult side of things. Some of it was cringe-worthy, as it is YA, but a lot of it is a modern version of Forever. Again, something you could read in a day or two while relaxing in the summer. As much as I adored First Light and When You Reach Me, this middle-grade/YA book by Stead was not good. It was a bit more YA than middle-grade, so I'd keep it to high-schoolers, not younger readers. However, I also wouldn't recommend it. Her books usually have some sort of twist in them but I couldn't find it in this. I listened to the last couple of chapters twice (this was on the Overdrive app, for free, thank goodness) and I feel like I STILL don't know what happened at the end. There were too many narrators, too much past vs. present, too many possibilities...I literally don't even know where the title came from. Don't read it. Ugh. So the first half of this book was fantastically done. It was like a more messed-up version of Once Upon a Time. The next quarter was iffy...I kept expecting it to get better again. The last quarter/third, I skimmed. It was terrible. Other people brought up problems with characters, narration, even race....I didn't see/care about that. It was just this make-believe land of confusion and it was very Alice-in-Wonderland-ish. By the end, I didn't care and knew I wouldn't be reading the sequel. This is why I don't do fairy tale books. However, I'll give it a passing grade because I really did like the first half. If you like fairy tale books, you may like the second half too. I tried this a few years ago on the Overdrive app and couldn't get into it so I returned the audio version. When I was browsing for something to listen to while I packed and cleaned, I gave it another shot. It was okay. I don't think it was life-changing. I would've been more into hearing about the virus and the global ramifications and less about a few of the characters. There were way too many characters and storylines and time-jumps and oh well. I never felt super-invested in it. I quit about 2 hours in. I still want to read Sourdough, though. They lost me 10 minutes in with the goat-skinning. Nope. 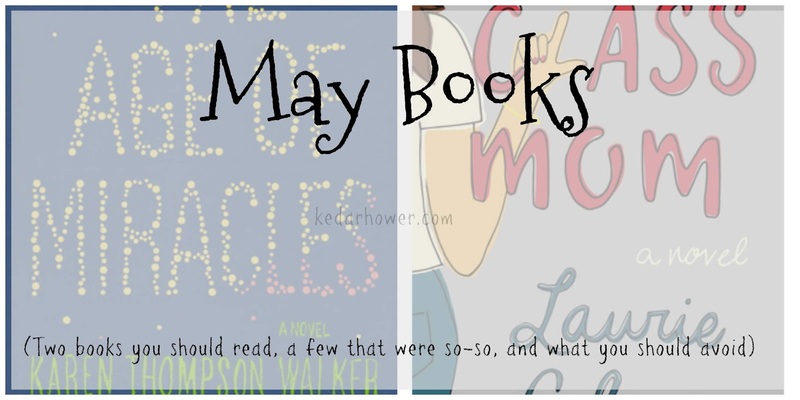 What was the best book you read in May??? I felt the same way about Hazelwood. I was super disappointed that it progressed into bleh. I definitely won't read the next book. I enjoyed Station Eleven, but I agree, I would've liked more on the virus itself and the global effects - I felt like that was skimmed over almost in the beginning and then not really explored again. i read the spoiler for wolf hollow because i was curious, jeepers! definitely not what i would consider appropriate... i loved i let you go but haven't read any of her other books because i didn't hear great things. boo. bummer about the hazel wood, i think i already removed it from my list but don't remember why. definitely adding the age of miracles. i despised station eleven haha. one i definitely should have DNF'd!